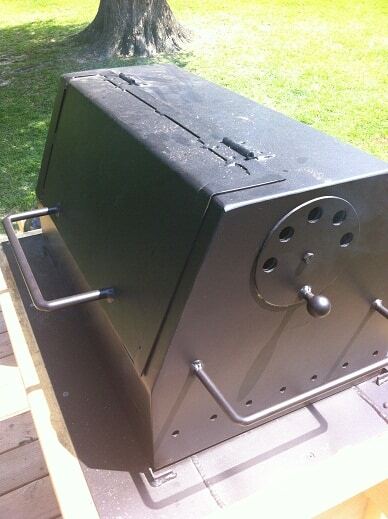 I wanted to share a post about a new toy on my deck, a Cajun Microwave! I have only used this guy once but I liked how it worked and wanted to plant some seeds in other folk’s heads. 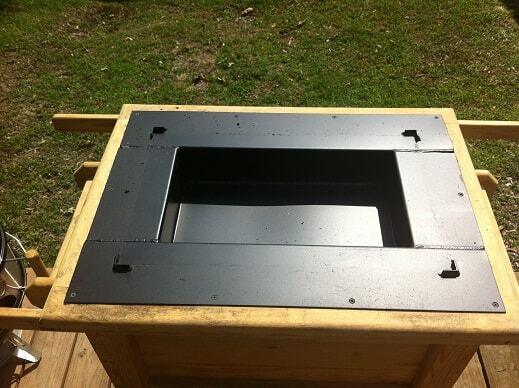 A Cajun Microwave is essentially the same thing as a Caja China. This is a tightly sealed roasting box with the heat coming from hot coals on the lid. This isn’t a traditional barbecue cooker since there is no contact between the smoke and the meat. 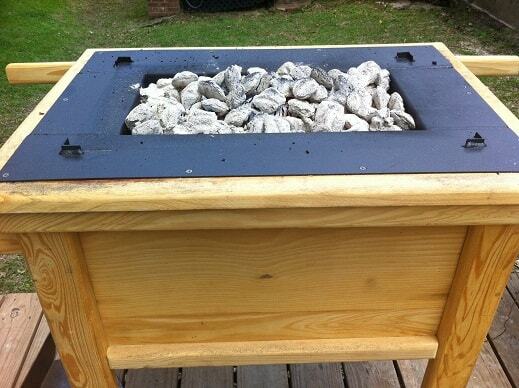 This is a giant charcoal powered outdoor oven which is a fun and useful tool. My cooker is not an actual Caja China but it works on the same principles. What I have is an authentic Cajun Microwave; a recreation craft project made by an inmate at Angola prison in Louisiana. For the trial run I trussed up a chicken, rubbed it down with some generic poultry seasoning and placed it in the bottom of the roasting box. 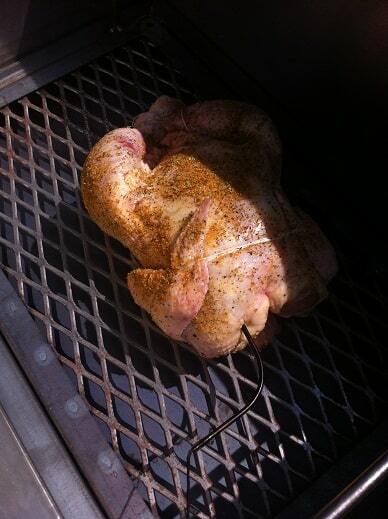 I inserted a digital thermometer into the chicken breast and ran the lead outside the box. I placed the lid on the roaster, filled it with charcoal (almost a whole bag of Kingsford) and poured a filled chimney of lit coals on top. I was very glad I was using the digital thermometer as it quickly became very obvious that I was NOT going to be able to lift the lid to check on the progress of the bird. The lid was very hot and very heavy and I was working this thing by myself. 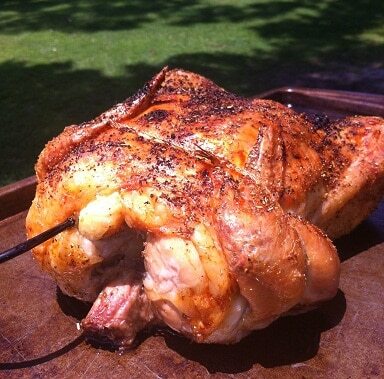 It took about two and a half hours for the chicken to reach an internal temperature of 175F. It should not have taken that long but it took me an hour to realize that the seal between the lid and the box wasn’t tight and that I was losing a lot of heat. Once I jimmied the lid into the correct placement the cook went a lot faster. Once the bird was finished I shoveled out the leftover charcoal (there was a lot) into my 18 inch Weber kettle and closed all the vents so it would burn out. I used the leftover charcoal over the next few days on different cooks so none of it was wasted. 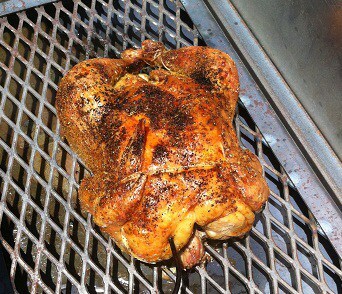 Here is what that lovely bird looked like coming out of the Cajun Microwave. I was very impressed with the crispy the skin and how evenly the bird was cooked. I can easily imaging roasting pork loins, turkeys, or just about anything in this box. This is like having an extra oven that happens to be located outside. I will be doing some more experiments to figure out what sort of temperatures I am actually getting inside the box. 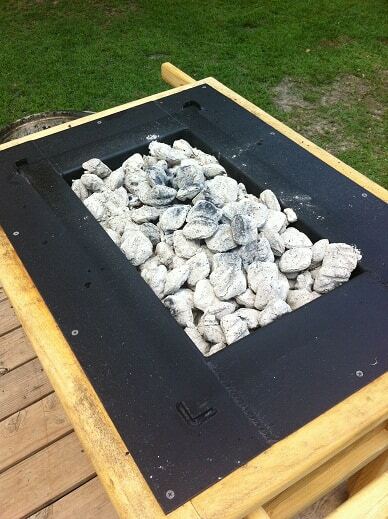 One nice feature on this cooker is an additional metal grill enclosure that can be placed directly over the charcoal. 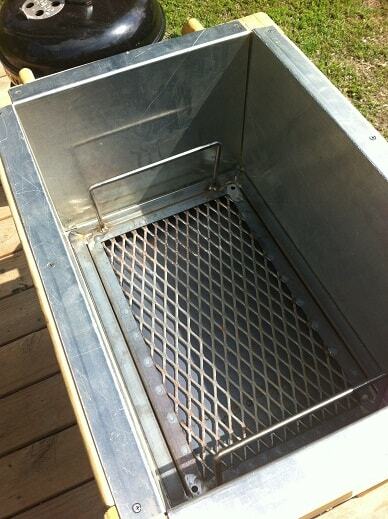 There is a cooking grate inside the enclosure so you could nominally do some grilling over the charcoal if desired. The real benefit I can see for the enclosure is that it is well ventilated but is enclosed enough that you could use it to shield your charcoal if it started raining. I had always been skeptical of the Caja China method of roasting but see now why this is so appealing. With the larger units roasting whole hogs, etc would be pretty easy and the price on them (~$300-400) is tough to beat. 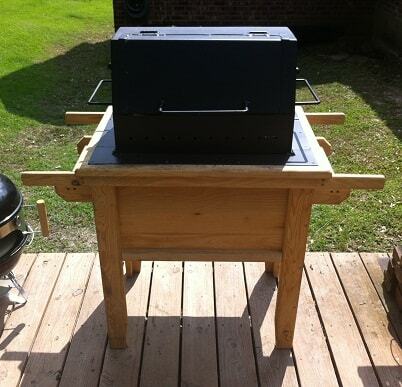 We used these things back when I was in LSU for cooking whole pigs. Been looking around the internet for one. Your’s looks quite nice. I see you got it at Angola, was it a one off or do they routinely have these at their fairs or way to get via the interwebs. Found you via the microwave but really like your site so will be looking around and taking notes. Brad, Thanks for swinging by! There are typically several inmates selling these at the prison rodeos in the fall. The amount of wood and metal craft works they have is pretty amazing. Twice a year Angola holds a Rodeo and Craft Show with the big show being in October. You can go to the Craft show and buy one from an inmate.